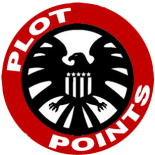 Welcome to Plot Points, a roleplaying blog and fan site focusing on the Marvel Heroic Roleplaying Game by Margaret Weis Productions. This blog features resources for new players, datafiles for both heroes and villains, and tips and tricks for playing the game. I hope you enjoy and frequently come back. There will be a lot of content to come. Excelent site! I really look forward your updates. Thanks! This entry was posted on February 20, 2012 by Mark in Introduction.